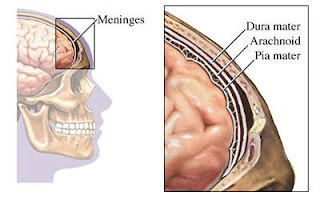 Meningitis is an inflammation of the meninges, the lining that protects the brain and spinal cord. It is almost always caused by an infection, usually by a bacteria (bacterial meningitis) or a virus (viral meningitis). In rare cases it can be triggered by a fungus or parasite. Meningitis occurs most commonly in young children under 5, those aged 17-25 (who often live in close quarters like dormitories and barracks), and people over age 55. 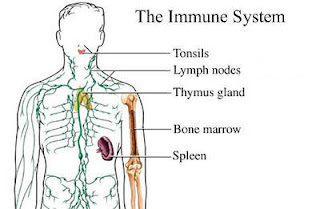 People with compromised immune systems, such as people with HIV or AIDS, are also at increased risk. What Are The Meninges ? The meninges are composed of three layers of membranes enclosing the brain and spinal cord. * Pia mater is the innermost layer. It is akin to a tissue paper that closely adheres to the brain and spinal cord, dipping into the various folds and crevices. * Arachnoid mater is the middle layer. It is a filmy membrane that is joined to the pia mater by fine threads resembling a cobweb. * The dura mater, a parchment-like membrane, lies on the outermost part of the meninges and adheres to the skull and spinal canal. 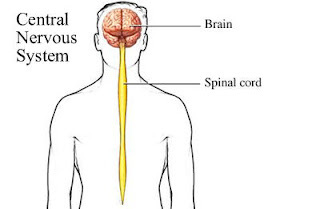 * The cerebral spinal fluid The fluid that surrounds and cushions the brain and spinal cord. (CSF) is the fluid that circulates in the spaces in and around the brain and spinal cord. What Happens When The Meninges Swell ? The most frequent cause of meningitis is the entry of a microorganism-such as a bacterium or a virus-from an infection elsewhere in the body. The microorganisms travel through the blood and into the meninges and cerebral spinal fluid. In the bloodstream, infection-causing microorganisms are fought off by white blood cells, an important part of the immune system. However, there are no white blood cells in the cerebral spinal fluid to fight infectious agents. Once infectious organisms have entered the cerebrospinal fluid, the body's defenses cannot control their rapid growth and the disease races through the delicate surfaces and fluids of the central nervous system. As the immune system gears up to fight off the microorganisms, it sends out chemical signals that produce inflammation and interfere with the normal functioning of the central nervous system. That, in turn, causes swelling and increased pressure inside the skull, and disrupts the brain's normal functioning. Bacterial meningitis affects fewer people than the viral form, but it often results in more serious health consequences. Bacterial meningitis is fatal in 1 in 10 cases and leaves 1 in 7 survivors with a severe disability caused by brain injury. The bacteria that cause these cases are common and live in the back of the nose and throat, or in the upper respiratory tract. The bacteria are spread among people by coughing, sneezing and kissing. These bacteria cannot live outside the body for long, so they cannot be picked up from water supplies, swimming pools, or a building's air-conditioning system. Individuals can carry these bacteria for days, weeks, or months without becoming ill. In fact, about 25 percent of the population carries the bacteria. Only rarely do the bacteria overcome the body's defenses and invade the cerebra spinal fluid, causing meningitis. Meningococcal meningitis accounts for more than half of all cases of bacterial meningitis in the United States. Meningococcal disease is caused by bacteria called Neisseria meningitidis. There are several strains of Neisseria meningitidis. Strain B causes about 75 percent of the meningococcal cases and has the highest fatality rate. Pneumococcal meningitis is caused by pneumococcus bacteria, which also cause several diseases of the respiratory system, including pneumonia. It has a fatality rate of about 20 percent. It also results in a higher incidence of brain damage than other forms of the disease. Neonatal meningitis: This form affects mostly newborn babies and is caused by Group B streptococcus bacteria, commonly found in the intestines. Staphylococcal meningitis: This is a rare, but deadly form caused by staphylococcus bacteria. It usually develops as a complication of a diagnostic or surgical procedure. Haemophilus influenza type B (Hib) is caused by haemophilus bacteria. It was once the most common form of bacterial meningitis, and one of the deadliest childhood diseases. However, in 1985, an Hib vaccine was introduced into the routine immunization program for U.S. children and virtually eliminated Hib meningitis in the United States. The disease can be caused by many different viruses. Some of the viruses are transmitted by coughing or sneezing or through poor hygiene. Other viruses can be found in sewage polluted waters. Occasionally, viral meningitis will develop following the mumps or chicken pox. Mosquito-born viruses also account for a few cases each year. Approximately half of the viral cases in the United States are due to common intestinal viruses, or enteroviruses Viruses that live in the gut and are usually shed in the feces and in discharges from the mouth and nose.. These viruses are shed in the feces and in discharges from the mouth and nose. Most people who become infected with the virus contract it through hand-to-mouth contact. Meningococcal meningitis often causes a distinctive rash. This rash is the result of a form of septicemia An infection in the bloodstream that results from some cases of meningococcal meningitis. It is characterized by a rash caused by broken blood vessels. (infection in the bloodstream), a potentially fatal condition. Septicemia occurs when the meningococcus bacteria multiply uncontrollably in the bloodstream. The bacteria release toxins into the blood that break down the walls of the blood vessels, allowing blood to leak into the skin. The leaking causes a characteristic rash, called a hemorrhagic rash. The rash can appear anywhere on the body, including in the eyes and often between the toes. The rash starts as a cluster of tiny blood spots, which look like pin pricks in the skin. If untreated, these spots gradually grow and become multiple areas of bleeding, resembling fresh bruises under the skin surface. The spots or bruises do not blanch (turn white) when pressed. How Is Meningitis Diagnosed ? If meningitis is suspected, treatment should be sought immediately. At the hospital, a doctor can make a quick diagnosis by withdrawing a small sample of the spinal fluid for examination. This procedure is called a lumbar puncture (spinal tap). It involves inserting a needle into the middle of the lower back and collecting some drops of fluid. The procedure can be slightly uncomfortable but is rarely painful with the use of a local anesthetic. Laboratory analysis of the spinal fluid will confirm if the meninges are infected. The tests can usually, but not always, determine what type of germ has infected the patient. * In mild forms of meningitis the lumbar puncture may alleviate a patient's headache, possibly by reducing the fluid's pressure on the meninges. At the hospital, blood tests are also taken to look for the germ in the blood and to check that the patient is otherwise healthy. In newborns, doctors may also check the fluid in their stomach with a small tube passed down the throat, and test their feces for the presence of suspected germs. Diagnosis cannot be made through imaging tests, such as X rays or ultrasound A harmless pain free test that uses sound waves to create pictures of the inside of the body. 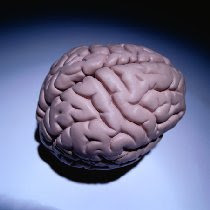 However, these tests can be used to insure that the brain is not in damage from pressure or the accumulation of fluid. Doctors may also order a chest X-ray, since as many as half of patients with pneumococcal meningitis also have evidence of pneumonia. How Is Meningitis Treated ? Doctors isolate patients with possible meningitis and immediately start them on intravenous antibiotics before they determine whether it's bacterial or viral meningitis. If the diagnosis turns out to be viral meningitis, the antibiotic treatment is stopped, because antibiotics have no effect on the viruses. In fact, there is no treatment for viral meningitis, the illness must simply run its course. Rest, fluids, and good nutrition, as well as measures to control fever and relieve pain, will ease discomfort and aid in recovery from viral meningitis. Patients with bacterial meningitis receive intravenous antibiotics for a week or more. In more severe cases, a patient needs medication to control seizures or must be put on a ventilator to assist with breathing. 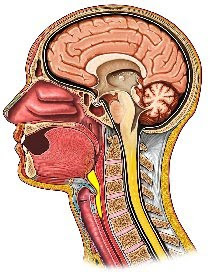 If excessive pressure builds up inside the skull, a small tube is sometimes inserted into the meninges Three-layer lining that protects and cushions the brain and spinal cord. to relieve the pressure. Drugs such as dexamethasone ( a steroid, different from the steroids abused by bodybuilders, that can reduce swelling of the brain) are sometimes given to reduce inflammation or to reduce the chance, or spread, of septicemia An infection in the bloodstream that results from some cases of meningococcal meningitis. It is characterized by a rash caused by broken blood vessels.. They are usually only given in severe cases where the response to antibiotics has been slow. * The usefulness of dexamethasone has been debated. Studies have shown that children with H influenzae type B infection who were given dexamethasone had fewer after-effects, such as hearing loss. However, doctors are concerned that dexamethasone can make it harder for antibiotics to reach the infection. In general, nearly all people with viral meningitis and 70 to 80 percent of people with bacterial meningitis will recover, although that varies by age and health of the patient. Although most people make a swift and complete recovery, meningitis (particularly the bacterial form) can result in a variety of after effects. Some of these effects are permanent and physically disabling and some are less obvious, affecting the individual emotionally. Can Meningitis Be Prevented ? Apart from vaccination, there is no known way to protect against meningitis. Although there is little people can do to prevent meningitis, they can limit its devastating health effects by recognizing the symptoms of the disease and seeking immediate medical treatment. Haemophilus influenza type B: The Hib vaccine, which has reduced Hib meningitis cases by 95 percent since 1985, is given to U.S. children in three doses (at 2, 3, and 4 months old). * All college students (unless pregnant), especially those ages 18 to 24. * People in close contact with individuals suffering from these strains of meningitis. * People traveling to Africa or other parts of the world where these types of meningitis are prevalent. The vaccine is not very effective in small children. Pneumococcal meningitis: Given to people at risk because of conditions such as chronic ear disease, head injury, immune deficiency or the absence of a spleen. In the event that there is no vaccination available (for example, in cases of strain B meningococcal meningitis) people in close contact with the infected person are often given antibiotics such as rifampicin to keep them from acquiring the dangerous germ. Another antibiotic A drug that weakens or destroys bacteria; used to treat various types of bacterial infections., ciprofloxacin, may be given to older children and adults. Rifampicin may cause mild stomach upset and a darkening of the urine. It usually must be taken for just two days and provides significant protection. Rifampicin may also be given to the infected person if there is a chance that the germ may still be present following recovery from a meningitis infection. Sometimes the families of small children with serious haemophilus infections are given a four-day course of rifampicin. There is no immunization available against viral meningitis. However, routine childhood vaccinations against mumps and polio have virtually eliminated infection from those viruses, which cause the most serious types of viral meningitis. Since most cases of viral meningitis are caused by enteroviruses Viruses that live in the gut and are usually shed in the feces and in discharges from the mouth and nose., you can prevent infection by washing your hands regularly, especially after changing diapers or coming into contact with feces. It can also be prevented by carefully washing and preparing food. This includes eating foods by the "sell by" or "eat by" dates, and by thoroughly reheating chilled foods before consumption.